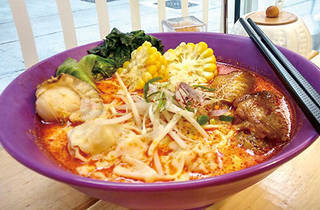 For those tired of the onslaught of gourmet ramen joints popping up like daisies, a simple joint like Noodies is a welcome relief. Located on Third Street in the Island’s latest culinary hotspot, Sai Ying Pun, the hole-in-the-wall eatery is run by good-natured waitstaff delivering totally customisable noodles served in MSG-free broths (huzzah!). In the grand tradition of Hong Kong cart noodles, the menu here lets you create your meal from the ground up – choosing first a soup base (tom yum soup, pork broth or laksa) and then adding the toppings you want. There are six different kinds of noodle to select, from Vietnamese pho to Korean instant noodles. 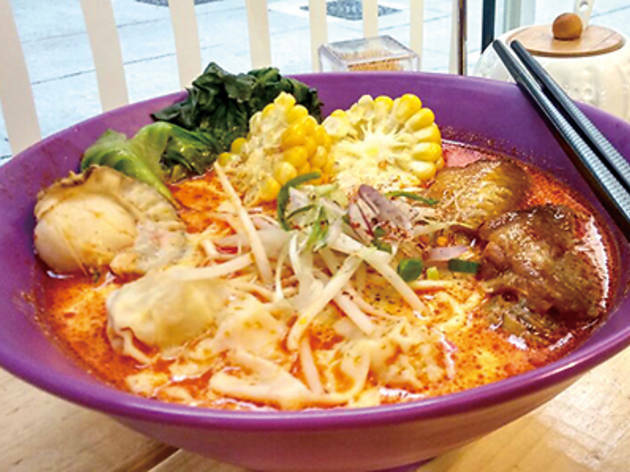 For lunch, we cobble together two tempting bowls – one featuring egg noodles in tom yum soup with sweetcorn, chicken wings and beef ($60), and another founded on pork broth with wontons and bean sprouts ($56). The tom yum soup is appropriately rich with a medley of Thai flavours, and not overly oily. In fact, the general lack of oil brings out the fragrance of the lemongrass all the more. Noodies Shop E, G/F, Fook Moon Bldg, 56 Third St, Sai Ying Pun, 2559 0080. Dinner for two: $120.